McGill's Bioengineering Undergraduate Student Society (BUSS) is a student organization which serves to represent the undergraduate students in the Department of Bioengineering at McGill University. BUSS is dedicated to providing academic and social opportunities to inspire, entertain, and guide its members through their undergraduate degree. 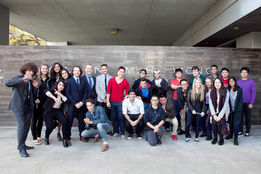 After the official formation of McGill's Undergraduate Department of Bioengineering in the 2016-2017 academic year, the first cohort of bioengineering undergraduate students collaborated with McGill's Chemical Engineering Student Society (ChESS) to integrate their department within the Engineering Undergraduate Society (EUS). BUSS was established in January 2017, after a unanimous vote by the EUS Council to recognize BUSS as an official student society under the EUS. The first ever BUSS Executive Committee was elected in February 2017. The first cohort of bioengineering undergraduate students at McGill.